Trainer Danny O'Brien was thrilled with his haul at the New Zealand Bloodstock Karaka Sales this week. 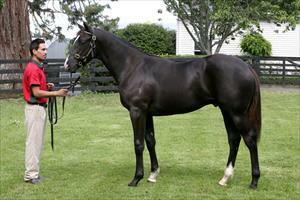 The Cox Plate winning trainer was able to secure colts from O'Reilly, Sebring (yearling pictured), Pins and Makfi. "We ended up picking up some really nice, well-bred horses without going over budget, which is always a positive, and our clients have an opportunity to get involved in some exciting prospects," O'Brien said.